Foreign Correspondent is a 1940 American spy thriller film directed by Alfred Hitchcock. It tells the story of an American reporter who tries to expose enemy spies in Britain, a series of events involving a continent-wide conspiracy that eventually leads to the events of a fictionalized World War II. It stars Joel McCrea and features Laraine Day, Herbert Marshall, George Sanders, Albert Bassermann, and Robert Benchley, along with Edmund Gwenn. The film was Hitchcock's second Hollywood production after leaving the United Kingdom in 1939 (the first was Rebecca) and had an unusually large number of writers: Robert Benchley, Charles Bennett, Harold Clurman, Joan Harrison, Ben Hecht, James Hilton, John Howard Lawson, John Lee Mahin, Richard Maibaum, and Budd Schulberg, with Bennett, Benchley, Harrison, and Hilton the only writers credited in the finished film. It was based on Vincent Sheean's political memoir Personal History (1935), the rights to which were purchased by producer Walter Wanger for $10,000. The film was one of two Hitchcock films nominated for the Academy Award for Best Picture in 1941, the other being Rebecca, which went on to win the award. 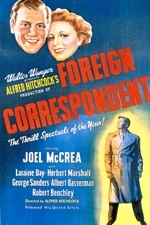 Foreign Correspondent was nominated for six Academy Awards, including one for Albert Bassermann for Best Supporting Actor, but did not win any.